Jimmy I would like to introduce your name to the new speedsurfing generation of the 21th century. I started speedsurfing in 2007 and heard your names a lot of times, so far I know you build some damn fast boards in the past. When did you started to build (windsurfing) boards? The first few windsurfers that I made were made in 1978. One of them was for Mike Waltze and the other was for Mark Robinson. 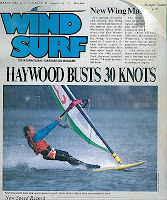 I shaped one or two in the next few years but it was in 1981 that shaping windsurfers because my main focus. What made you start building your first speedboard? 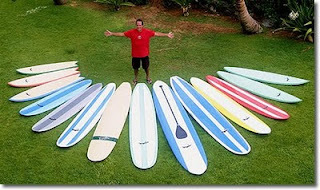 I was shaping windsurfboards for Sailboards Maui starting in 1981. 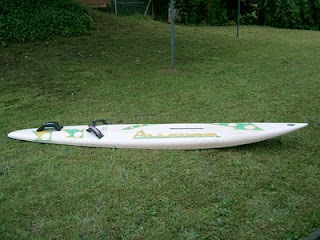 It was in 1982 that Pascal Maka came to Maui and bought an 8’6” X 21” wide wave board from Sailboards Maui that I had shaped. He took that board to the Weymouth Speed Week and broke the windsurfing speed record on that board. Back on Maui we were ELATED with that news and we (me and Fred Haywood) because very intrested in speed boards. I began to make some special boards for Fred to take to Weymouth the following year (1983) and at that event he broke the windsurfing speed record again by doing 30.82, I believe. If I am right did some big brand produced “Jimmy Lewis” speedboards, could you tell more? I was working for Bic from 1987-1988. I made a speed board for their production line. It was 9’ X 18” wide and it was called the Allegro. What is the greatest achievement in speedsurfing for you? My greates achievement happened in 1986 when Pascal Maka, Erik Beale, Fred Haywood and myself broke the absolute world speed sailing record in Fuerteventura. Pascal did 38.86 knots. The previous absolute world speed sailing record was held by a 60’ catamaran and that time was 36.00 knots. All 4 of the sailers who broke the record (Pascal, Erik, Fred and myself) were riding my boards as well as the next 3 in the competition. The top 7 sailers were all using my boards. After that event I was number 3 in the world ranking which to me was “icing on the cake.” I normally wasn’t the strongest competitor at the speed events. If there were 60 riders in the event, my ranking was usually somewhere in the middle....... about 30th place. So having all of my boards do so well at this world record breaking even AND me getting third place was the greatest achievement in my speedsailing AND my windsurfing career. The next year Eric Beale broke the record again using my board and at the same time became the fastest sailing craft over 40 knots. This was a great achievement too but it didn’t compare to the thrill of what happened in 1986 in Fuerteventura. 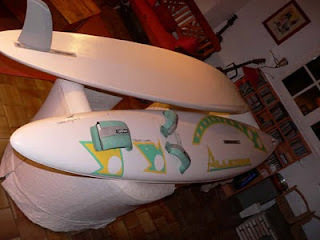 I make surfboards, a few kitesurfboards and a few stand up surfboards and I run my production board business which is kiteboards, surfboards and stand up boards. Any tips when starting design a (speed)board shape by myself? Try to find one of my old speed boards and copy it!! !